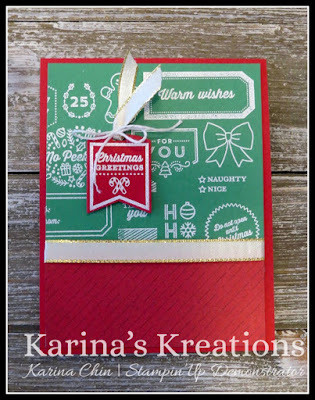 Create beautiful cards with the Tags and Tidings stamp set and Christmas Tags Thinlits Die. I love how you get multiple images with one stamp set. The image was embossed with Versamark ink and White embossing powder on Call Me Clover card stock. I added a little All is Bright Designer Series Paper to the bottom of the card and covered the seam with Gold 3/8" Metallic Edge Ribbon. This stamp set is retiring so click on a picture below to place an online order.